The LaNN laboratory is one of the most important nanofabrication centers in Italy and it’s active in several research fields. 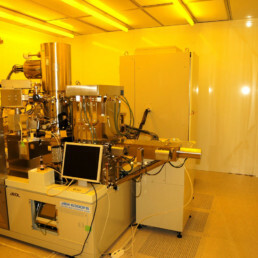 Electronic lithography (EBL) is a technique that uses a focused beam of highly energetic electrons to write very high resolution patterns (≦ 8nm) on a substrate coated with a sensitive film (resist). The beam scans the image to be displayed according to a pattern previously defined on a CAD file. The structures thus defined are detected by subsequently developing the resist in an appropriate solvent. The aim, as in photolithography, is to exploit the resist as a template for subsequent pattern transfer techniques such as dry etching or metal liftoff. is equipped with GenISys BEAMER software for proximity correction.